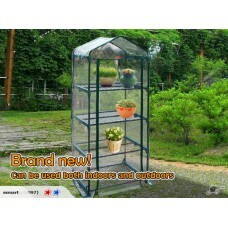 Brand new 4 Tier Portable GreenHouse. *It can protect your plants from too much heat or cold, shield plants from dust and gale, and help to keep out PESTS. *It has a strong powder coated steel frame and Transparent PVC cover with zips for easy access and ventilation. *Inside there are 4 tiers, ideal for pots and seed trays. -We would appreciate if you could complete payment for this WITHIN 7 DAYS.We do however understand unforseen delays if we are kept informed. please view my profile for more info about terms and conditions.